First off, the reason I put the word "Adventure" in quotes, it's because it's not so much an adventure as it is a locale - a fully-described locale, but generally "empty" in regards to monster and treasure. This was an intended support piece for Valley of the Five Fires, and I still like the story it sets up, but it never really came together as an adventure. I think it's got a pretty cool backstory, but anything I would have stocked it with wouldn't really have fit well in the context of the module, so I dropped it. Unlike the freebies I usually put up on the Free Downloads page, this one is available from RPGNow, since the last page is a pretty blatant promotion for the complete Valley of the Five Fires module (available in print from Lulu.com, and available in PDF from RPGNow). BTW, the 5th page is not previewed below, but is pretty much the same as this. 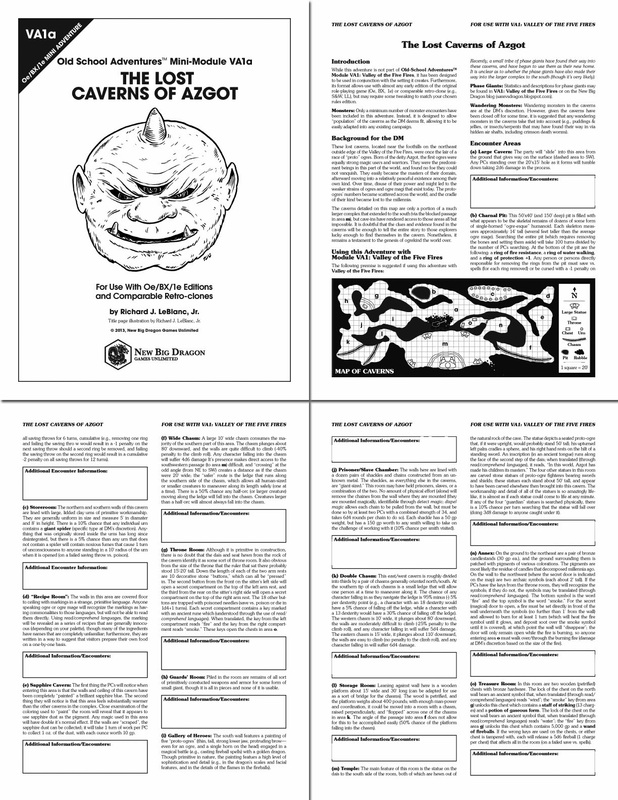 The Lost Caverns of Azgot.